Somehow, I knew I'd leave it all unfinished. Some deep, intrinsic knowledge that regardless of time, effort, and money spent, my passion for the background, the sheer coolness of it all, it would all fall by the wayside. I talk, of course, of my Iron Hands army. 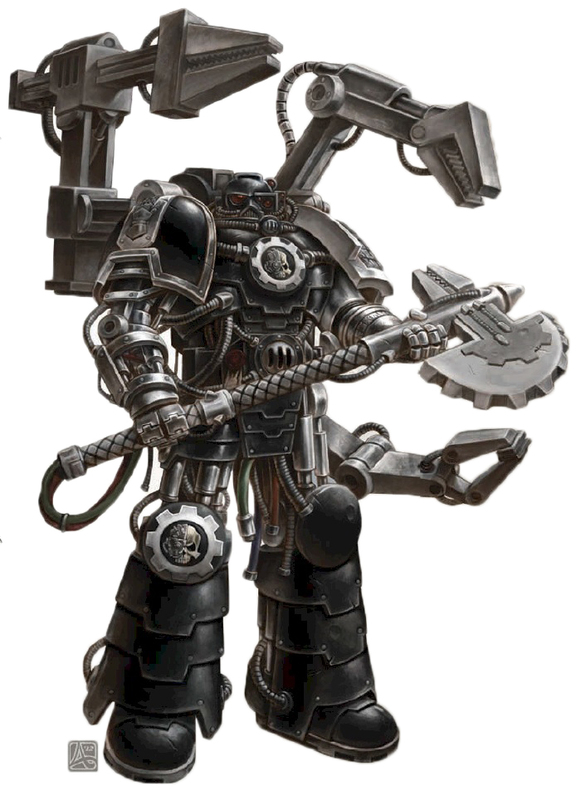 Iron Hands - The flesh is weak, but ridiculously massive battle-wrenches are decidedly strong. A collection built up over several years, with hundreds of models, and nary a squad painted. Oh yes. Plastic crack at its best. Despite my deep love for the Iron Hands, it was a project I had to leave behind. I'd spent too long determined to make every model unique, to convert the living crap out of anything and everything, often changing things as I go, adjusting, restarting, leaving everything unfinished. This is not a good way to work, despite being fun it just leaves the things you have and the drive you have to complete them in a perpetual state of repetitive nothingness. I will start it again, but first I'll wait to see what the 6th Edition brings. As it stood, I'd not done anything for at least 6-8 months, not since our last group outing to Warhammer World. The spark hadn't gone anywhere, I still voraciously devoured the books, background materials, codexes and forums for all things 40k, but for some reason I just didn't touch anything from the army again. Alas, for now, the Iron Hands stay mothballed, deactivated as it were. Try deactivating these guys, they literally swap out their limbs and organs. My loyalty temporarily renounced, I venture to the darker side of the 40k universe, to Chaos.. So, something had to be done. A new beginning, but what to do? Chaos seemed the thing to do, I have a massive love for big things in mean-looking armour. Admittedly, the Eldar codex has just arrived, and I've long fancied doing a mostly-wraith army using the Zahr-Tann colours, but heck, that can be my next hundred-year project.. Anyway, I needed a new army, something that I wouldn't get bored with, something that could capture my imagination and provide ample opportunities for modelling, but with more kitbashing and less constant distraction by conversion.. 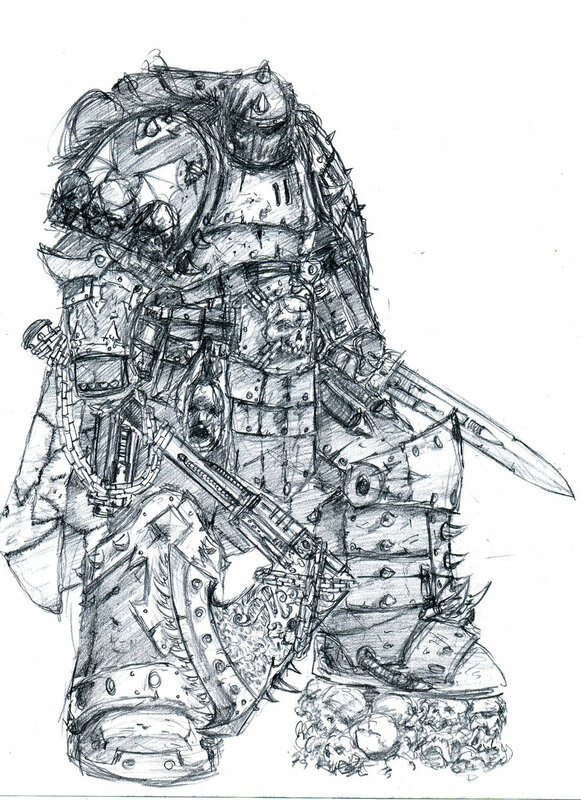 Chaos seemed the natural choice, I could go for Heresy-era, post-heresy, modern renegades using regular Loyalist kits.. I didn't want to create my own warband, as much as I love the opportunity for creativit, I don't want to fall into the trap I find with home-made warbands/chapters/craftworlds/hive fleets, where hyperbole and coolness gets turned up to 11, and you end up with the one craftworld immune to Slaanesh, the descendants of the missing Astartes Legions, etc..
As such, it had to be something known, so I figured I'd look at the 9 traitor legions, and make my pick..
Death Guard? - Cool, but Ben already has them, so a no-go for now..
Luna Wolves/Sons Of Horus/Black Legion? - Too black, I'm done with black for a long time.. Thousand Sons - Cool, but not what I want with this army..
Word Bearers - Too preachy..
Alpha Legion - Very cool as far as ambiguity goes, but too many scales to paint. Emperors Children - How DARE you kill Ferrus Manus! Bastards! Iron Warriors - Iron Hands, then Iron Warriors? I do like iron..but no..
World Eaters - Cool, but too one-dimensional. And too damn red. Leaving me with the Night Lords. 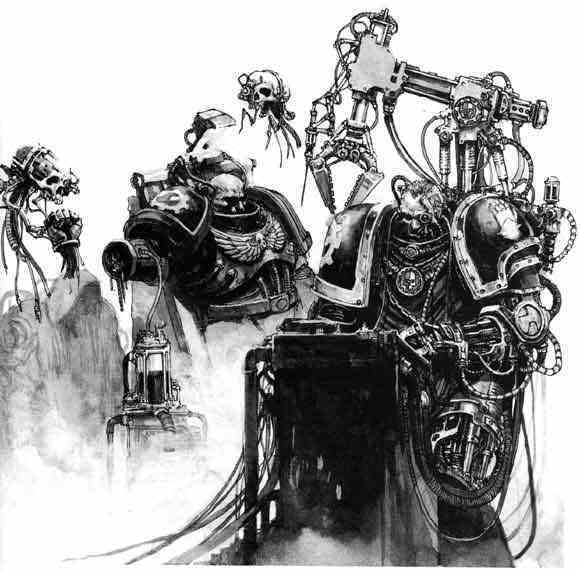 Okay, no Astartes will ever be as cool as these guys. Ray just called them Bela Lugosi Batman Marines, and now I hate him, but I can see why people would say that, purely if they hadn't read the trilogy from Aaron Dembski-Bowden. Aaron single-handedly turned them from an intriguing enough legion into a fascinating, multi-faceted, amusing, and overall *human* legion, in the sense of being able to relate to them in the way that the personalities and mannerisms of the outwardly autistic loyalist marines somewhat stymie attempts to empathise. Here we had a sundered legion, scattered warbands living raid to raid, the very essence of the degradation and failing of the legion during the Heresy Era, perfectly personified as scavengers, thieves, pirates, with the squandered potential of warrior gods and champions of renown. However, barring occasional examples, for the most part they are shown to eschew Chaos and its dubious boons. This is a story of Night Lords Astartes, Red Corsairs (my other choice, but in the end I knew I'd get fussy like with the Iron Hands if I had too much choice) and the Mechanicum (not the Dark Mechanicus, a crucial distinction there), and simply sowing incredible terror. The story of First Claw is at once captivating, amusing, thrilling, shocking, sad, and almost, in its strange way, hopeful. Aaron managed in one fell swoop to make me root for people you wouldn't cross the street to spit on. With this in mind, I chose the Night Lords as my new patron army, but I couldn't stay entirely loyal to the series for a crucial reason. True, they tend not to have all the powers of Chaos at their beck and call in the way that the Word Bearers may have, but without some lean that way, using the Chaos Codex as a basis for the army could leave me critically underpowered if I wasn't able to utilise all of the units in the army list. As such, I had to go in a certain direction, dedicate the army to a specific power. Nurgle? Nope, the Night Lords are lithe, acrobatic killers, not bloated shuffling slabs. Tzeentch? Not a bad idea with discs, but the mutation and Rubric marines just won't fit..
Slaanesh? Enjoyment of fear, yes, indulgent narcissists, no, Night Lords are strictly business! Khorne? Bitter, angry fighters, imbued with angry fighty power? I can get my head around this..
Khornate Night Lords. This I can get my head around. We already saw Uzas in Aaron's trilogy, and whilst not as much of a badass as Xarl, the blood god certainly packs a punch in his supplicants..
Yeah. That works just fine. Whilst having some outwardly Chaotic affectations, this isn't an army that needs to go crazy with it all, the sheer look of terrorising superhuman killers alone is something that would render most combatants self-soiling. Ergo, I'll be using more Khorne symbols than Chaos stars, it's more apt, calling on the favours of a god whose bidding you'll already be doing is never a terrible idea. They'll be modelled as Aaron wrote them, desperate scavengers taking mixed and matched pieces of armour from enemies and fallen allies alike, giving me plenty of scope to make kitbashing into an art form, a very eclectic collection of parts and weapons. This way, I get to add things like Helldrakes, Forgefiends, Maulerfiends, the units built solely to kill. Plus, I'll not be stopping at codex units, Forgeworld have a lot to offer as well. Besides the obvious stuff like Khorne conversion packs, I'll be going for Decimators, Blood Slaughterers, Dreadnoughts, and even a Brass Scorpion. Terror and violence go hand in hand, it seems. So. A not insurmountable army, with a pretty neat theme to them. I reckon I can do this.